Senior CNN executives have discussed giving White House correspondent Jim Acosta his own show. Internal discussions about Acosta's show have been "serious, but far from final," according to BuzzFeed. Acosta's profile has risen since Wednesday, when he invoked the Statue of Liberty to attack limits on immigration to the United States in a heated squabble with White House policy adviser Stephen Miller. Some at CNN have questioned why Acosta's behavior was appropriate, given the 2015 suspension of CNN Global Affairs correspondent Elise Labott for tweeting, "House passes bill that could limit Syrian refugees. Statues of Liberty bows head in anguish." Sources told BuzzFeed that the difference is the "very different kind of relationship" the network has with the Trump administration. "This stuff never happens in a vacuum," said one CNN source. "Times are very different" from 2015, said a CNN TV executive. "Acosta posed a question (albeit a loaded one) rather than making an affirmative statement." 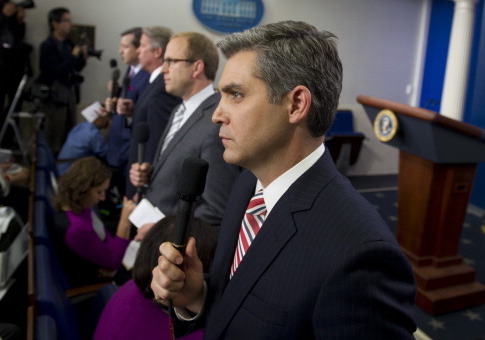 Some CNN employees think Acosta was "fighting the good fight," while others have rolled their eyes at him for coming off as sanctimonious. The CNN executive who spoke to BuzzFeed said, "Acosta has been reminded in the past that the press is not the story." This entry was posted in Culture and tagged Buzzfeed, CNN, Donald Trump, Jim Acosta. Bookmark the permalink.